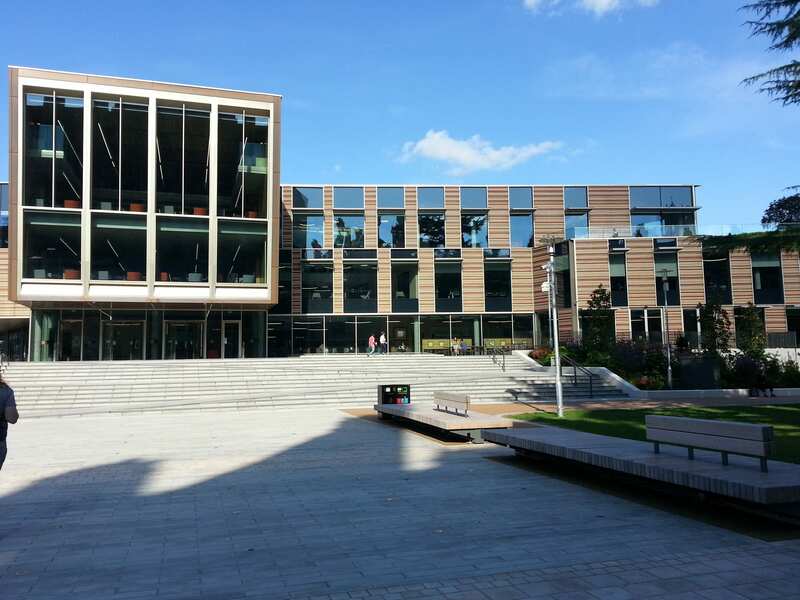 Thanks to the Customer Service Group UK, this summer I, along with other lucky Information Assistants, was able to visit the library of another University and learn about their experiences. 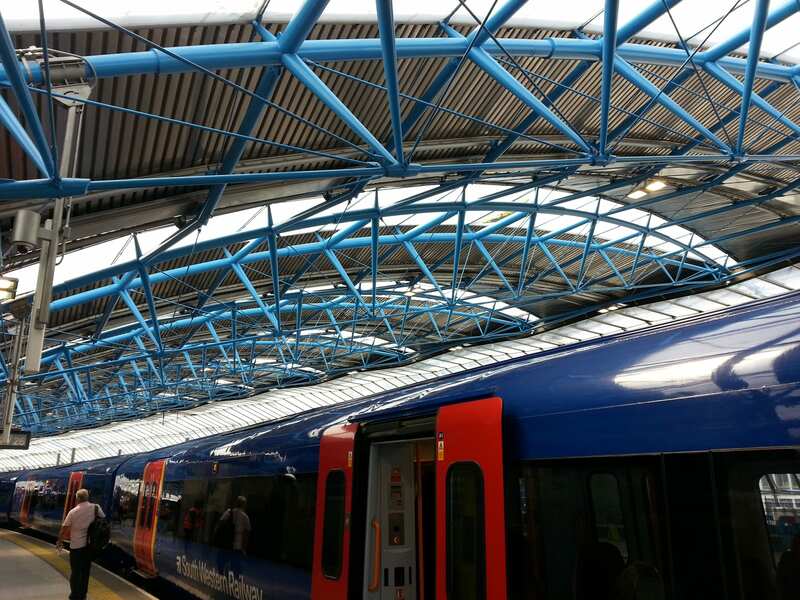 I was quite keen on a visit to Royal Holloway (I have wanted to go ever since first seeing a photo of the Founders’ Building) and was duly dispatched out to Egham, which is a bit of a trek, but one that took me through one of my many ancestral lands – and via the old Waterloo International platforms, now being made part of Waterloo following a stint as a theatre. I got a little lost, too, after deciding to take the Google Maps shortcut – and I wasn’t the only one. And after a long hot walk up a hill, my first view of said Founder’s Building was worth the effort. The final approach on arrival – my it was hot walking up the hill! But, daydreaming aside, the trip consisted of a talk from fellow Holloway IAs about the operation of the new library following its opening, before a tour of the premises and a chance to ask questions and share experiences. Ultimately the new library replaced two older ones that had become oversubscribed as students numbers have grown – one of our hosts even commented that they had heard that the newer of these two, built in the 90s, and never really been fit for purpose. 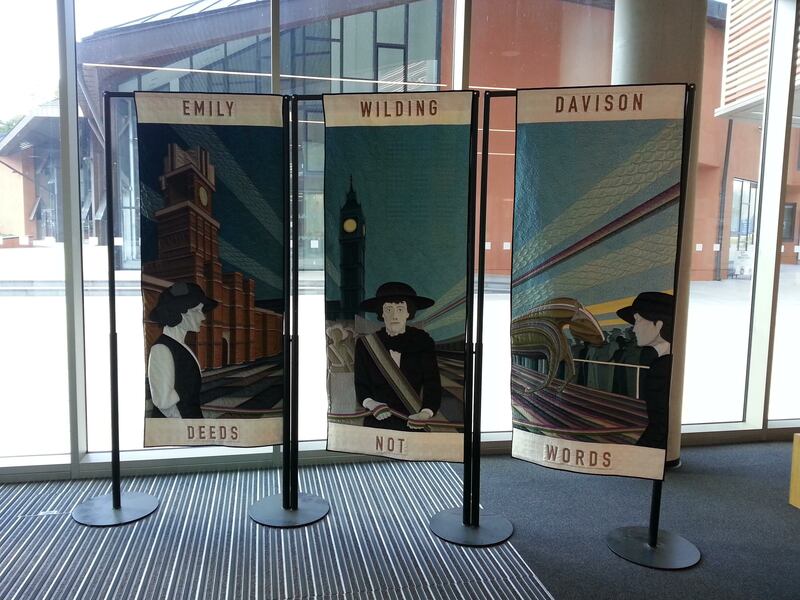 As these libraries were so oversubscribed, there had been issues with student behaviour as a result. Part of trying to soothe issues had been employing a Study Spaces Assistant (from January to April each year) to patrol the study areas. Interestingly, Holloway have space saving cards allowing students to save a study space for 45 minutes if they need a break – part of the Study Spaces Assistant’s role is to move items if people have taken too long over their break. 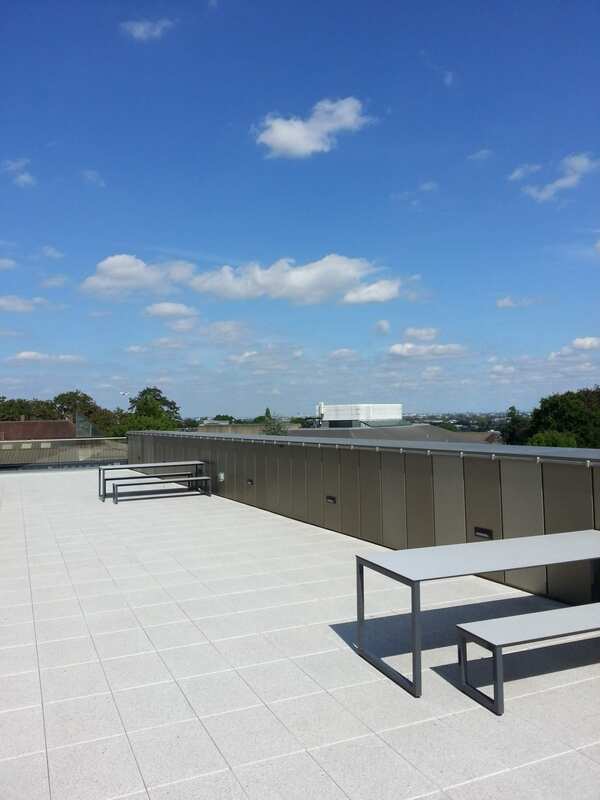 They also Tweet study space availability and generally keep the spaces study spaces. Such has been the success of having a bigger library with extra study spaces that the Study Spaces Assistant has gone from being seen as the Library Policeman to being referred to as the Space Man. How this will develop if numbers continue to grow, we shall see. Currently, though, in the first year, belongings are moved far less and complaints have gone down. The user services staff has been reorganised into dedicated customer services team of 10 (plus another 30 to cover extended opening hours), the IAs of whom, work only on the frontline desks, manning the Enquiry Management Service (a sort of triage that gets enquiries where they need to go and look after the social media output – they had 10,000 enquiries in the first 6 months of the new library) and roving every hour, on the hour. There was a sash for roving. It did not last long – it worked well in getting attention but was not comfortable or practical to wear. The Collection is housed in an interesting way. On the ground floor is kept the High Use collection, with the General Use collection being kept separately in different areas upstairs. The High Use collection comprises about 19% of the overall collection but makes up more than 50% of all loans. Both consist of 24hr, 1 week and 3 week loans. Students were consulted about the use of space and, perhaps not unsurprisingly, most of it has become Silent Study. Interestingly, despite all this lovely new space, one of the reading rooms in the oldest of the older libraries (and housed in the Founder’s Building) is going to re-open later this year because no amount of brand new space can replace the old building atmospherics. They have a book sorting machine! This was quite exciting to see up close as I have only ever seen one through a window (this one is kept in a special room). It takes books from returns machines and then sorts them into High and General Use. As trollies are filled with the returned books, slips are placed recording the time so that they can record statistics on how long shelving takes. Holloway have laptop loaning cabinets but have had some issues around their use as they can be difficult to return, meaning that security will sometimes end up making a pile of returns after hours. Rolling stacks have been used to house a proportion of the General Use collection. However, they have found them near impossible to re-shelve due to students needing access and meaning a need to change shelving times. A lack of initial signage may have caused an intial problem with noise. And getting the temperature right was experimental at first. 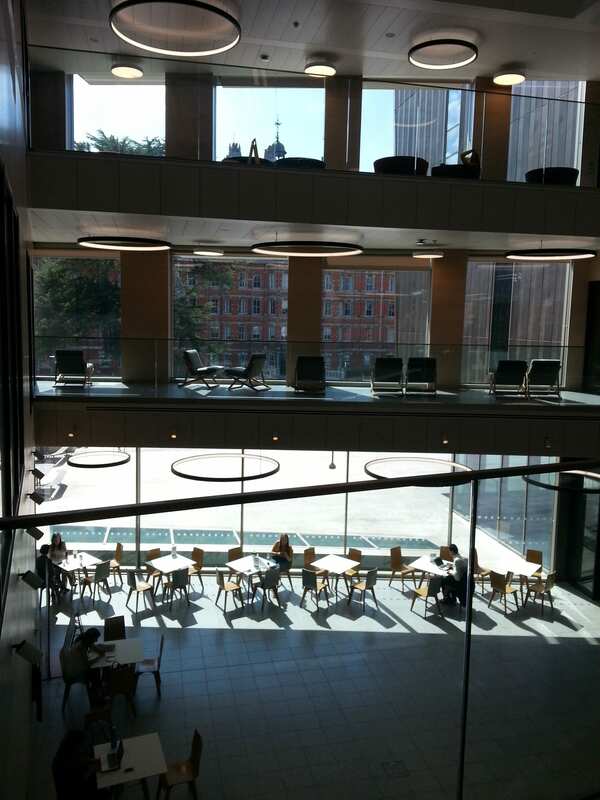 Yep – there are deckchairs style soft chairs on the bridge bits between the study spaces that look out the building across to the Founder’s Building (see below). There is an array of seating styles and configurations in the group study areas (nicely accessible furniture, I noted, still viewing things through the eyes of an accessibility auditor). There are lovely little one-person desks at the sides of the silent study areas that reminded me of the (now destroyed) desks I used to use as a UG. They had a lot of bookable Group Study Rooms (booked in a similar way with similar – maybe even the same – restrictions as us). These have nice little tablet displays outside that show the bookings for the day and with coloured lights that show if there are booked or not. They have a specialist area for PG (Research) students that is rather nice. Interestingly, one of the snags they found is not having enough printers in certain areas and so this space will lose one of the printers that is underused. They also had a lovely feedback corner in this space showing how much students love it. It could have tunnels linking it to the College, University and Tait building, potentially Drysdale and Sebastian Street, why not? One strange, but also lovely thing, was that they had security gates much like ours at the entrance which had been left open. 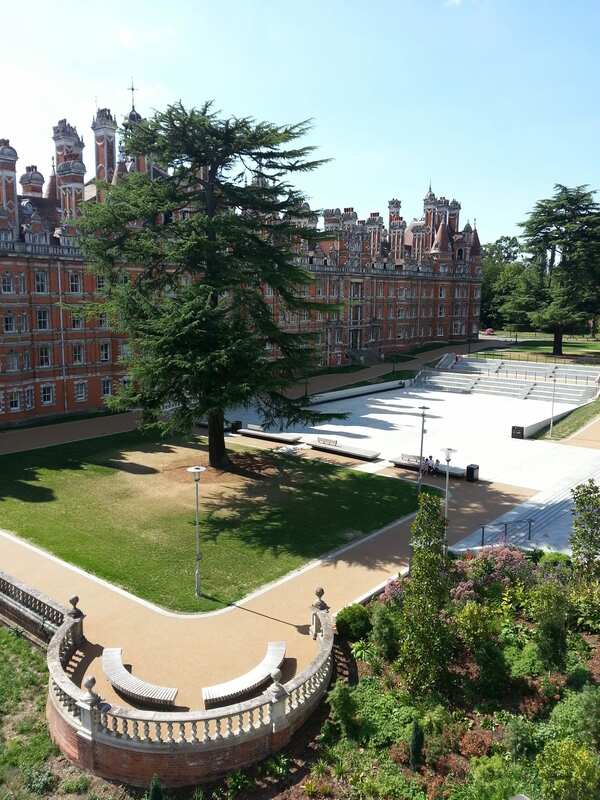 This is permanent – while building the new library, they were informed that one of the founders of Royal Holloway had stipulated that it must be open access to all. This means that they will never be allowed to use the gates! 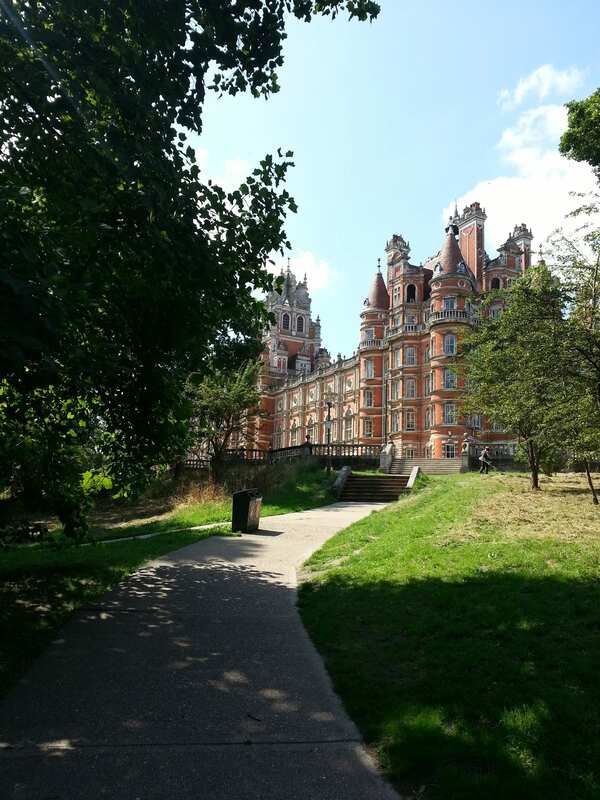 Although there is a membership fee for Royal Holloway, members of the public have free reference access. A floor or two for each school, creating a mini library for each tailored to their student’s specific needs and named after their UX personas. So thank you very much to Derek, Customer Service Group UK and my Holloway Hosts for an enjoyable, interesting and thought-provoking afternoon. For further info – I have a guide to the building on my desk if anyone would like to take a look. We could project a book sign on to the sky…or have a great eye on top! Possibilities! Thank you for the great review James.